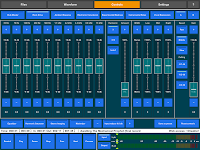 If the MIDI Pattern Sequencer it's near to beginning of music creation, my new project - Audio Mastering Studio it's the final touch of recorded track. The tool that gives the final polish the recorded composition. So, very soon will be available in App Store the first fully functional audio mastering application for iPad. For everyone who wants to make own music tracks professional quality. 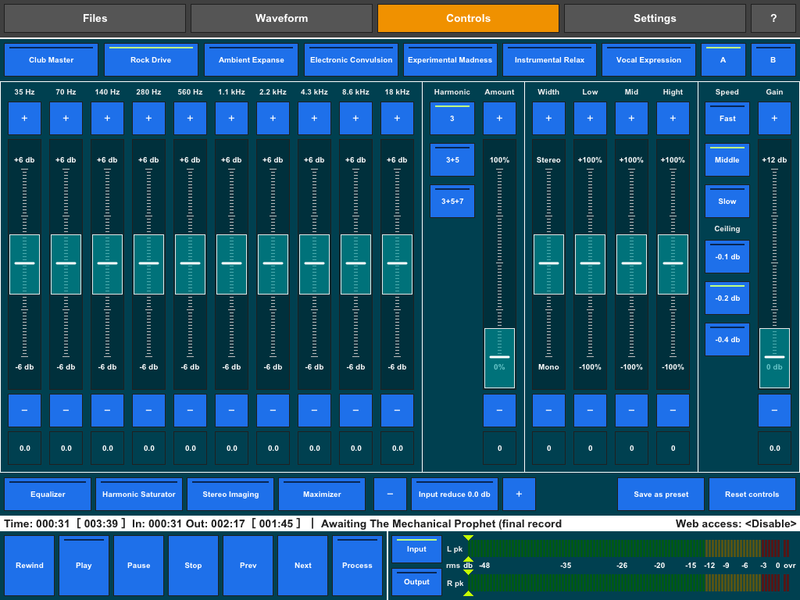 Based on the same algorithms which used in professional plug-ins this application turns your iPad into a real mastering studio. This project is done in cooperation with a professional sound engineer Andrew Startsev who has been developing and producing audio devices and software for audio recording and mastering for many years. 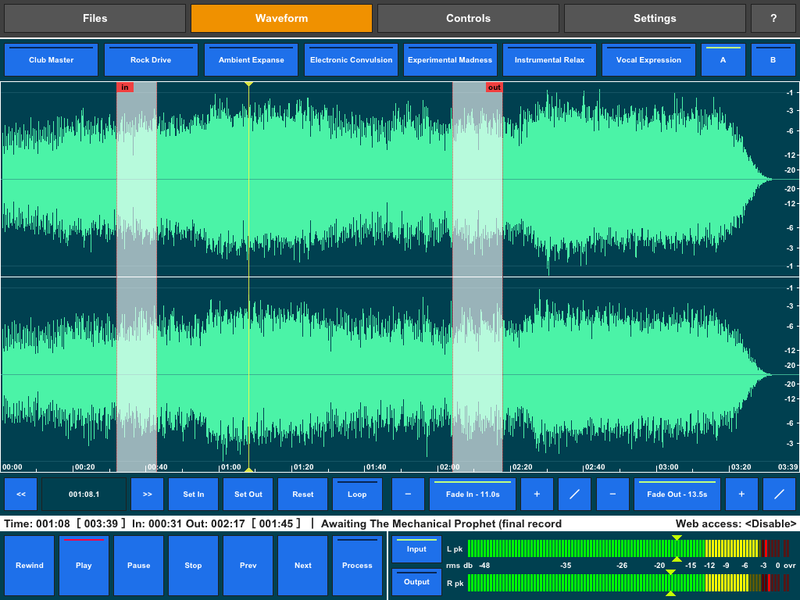 This all-in-one tool lets you process sound, converts audio formats, change sample rate, convert bit depth, cut part of track for demo or preview and make fade-in and fade-out. 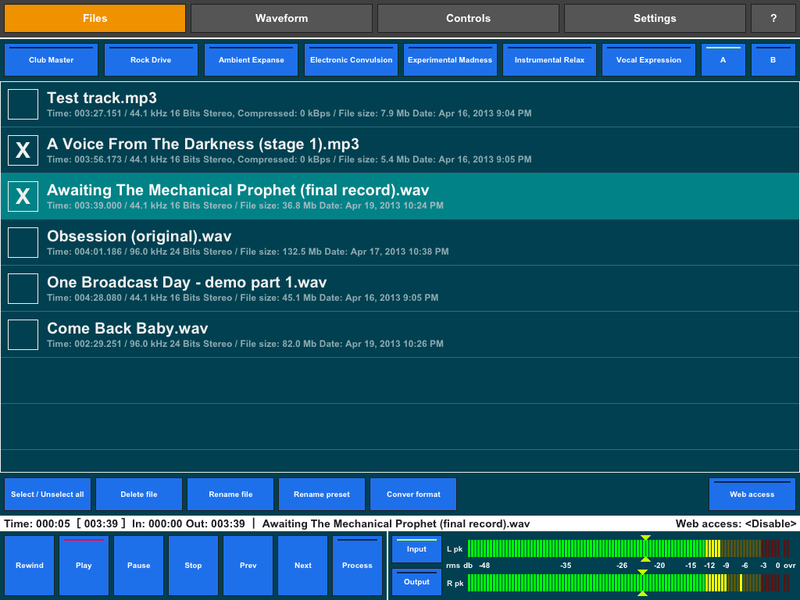 With very easy and clear interface you can tweak all controls in real time and hear final result right away. All settings will be stored for each track and you don't lose accidentally the best sounding of your composition. Also this feature allows you to upbuild common style for all tracks of your album and finalize all of them at once. Built-in presets for popular styles allow you to quickly find the general mood of composition and slightly tweak to get a better result. If you have own preset that you want to use for future you can save it in one of presets hotkey. Linear-phase 10-bands graphic Equalizer based on phase shifts that has unique soft sound very close in sound to the quality analog devices. Harmonic Saturator with three sets of harmonics will give more fatness and warm in your sound something like a tape recorder. Stereo Imaging takes control of sound space of your composition and lets make sounding wider or narrower in each of three bands. Loudness Maximizer can increase RMS of your track to give a powerful sounding without audible distortion. 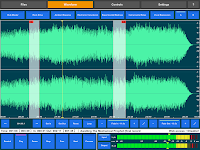 Carefully using all features of this application you will be able to reach a new level of quality of your music.